Off season is finally over, teams and cyclists are gathering on different team building sites, some to "boot camp", while others, like Saxo, turns to exotic Israel for their first team building. Is it time to review the year now? I have been thinking of making a "best of 2011"-post for a couple of weeks, I really enjoy reading others posts about that, searching videos on YouTube and so forth. This year has been fantastic, we have seen great racing taking place. Luckily, there was a certain spread in winners, perhaps with the one exception being Gilbert. He didn't win the most obvious race, Il Lombardia, hope the other riders see this as a sign everybody can be beaten. 2011 also proved to be a very sad year with the tragic death of Wouter Weylandt. It is not easy to evaluate top performers in sports, too many feelings, nationalities and other interests involved. I have decided to call them moments, to avoid the best performers debate, in my world, top performer does not automatically equal winning, although I do of course, recognize the obvious achievement. 10. The aggressiveness of Francais des jeux, putting riders in almost every breakaway this season, making it very entertaining to follow races. Chapeau Jérémy Roy and the others! 9. Team Britain during the Worlds in Copenhagen. It been long since I have seen a team riding at the front all day, all riding so selflessly. Ok, so it went to pieces the last oh-so important kilometer but still, delivering a sprinter like Cav in that position with one click to go should ensure business, which it obviously did. 8. French cycling's riders Thomas Voeckler and Pierre Rolland. Voeckler actually got recognized by many as a genuine contender for the GC, he put up a terrific fight. His TT skills is something he need to work very hard to be a podium contender next year. Rolland partly for his win on Alpe d'Huez and partly for his part in defending Voeckler's yellow. I think he will be a force to follow closely in the years to come. 7. Edvald Boasson Hagen's stage win in Pinerolo Tour de France. First of all because of a will to win and a stamnina few riders have. The day before he was outsprinted by fellow Norwegian Hushovd, EBH then decided to win the next day. Trying relentlessly to get in the breakaway all day, he succeeded, rode Chavanel off his wheel and solo'ed to the finish line. Perhaps it's time to stop calling him a giftet talent by now? 6. "New" riders stepping up to the challenge. We had many this year, too many to mention all, but Sagan, Kittel, Degelkolb and Offredo to mention a few, is just great. I really see this as a new start if you like, for cycling, after many dark years. 5. Mark Cavendish winning the green jersey. I could say the worlds too, but it is his achievement during the tour that I feel deserves a mention. With new point rules he stepped up to the challenge and really fought for his points, everyone of them. His wins were amazing, not every win as dominating as last year but still mighty impressive. The green jersey is dear to me, it is not a pure sprinter's jersey, more of an allrounder, at least historically speaking. 4. Alberto Contador and his giro was just phenomenal. No one was even close. He came to the race with a big uncertainty hanging over him, as I write this it still is. He proved to be very strong psychologically, one can say much about him, but that really impressed me. His way of climbing on the stage to Etna really gave the race a serious blow, being so much better than the rest. He rode well during the tour too, proved to be strong mentally again, and he contributed to an excited race with his attack. 3. Thor Hushovd's solo win during the tour wearing the rainbow jersey. A sprinter turned classics rider, Hushovd attacked early on the stage and fought his way over Col d'Aubisque, to pass the brave Roy with 3 clicks to go. Fantastic to see a stage win like that in that jersey, brought back memories of times almost forgotton in cycling. Powerhouse Hushovd. 2. 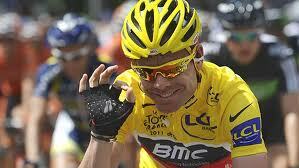 Cadel Evans winning the tour. Evans have tried many times, this time he got it, leaving the two Schleck brothers as runners up. L'Equipe showed a drawing in the newspaper the day after, where Cadel holds two spotted fur up while standing on the podium. The team rode steady the whole tour keeping Cadel out of harm's way and he finished it off with a powerful TT securing the yellow jersey. Classic scenes. 1. Phillipe Gilbert winning almost all he wanted. Unbelievable palmares, winning the Ardenner triple in a convincing matter. Crowning the year by wearing yellow and green during the tour, winning a stage too. No wonder he tops almost every ranking. Hoogerlands bravery after being clipped by that French TV car, the way the giro handles social media. It is smaller than then tour, and the tour is the pinnacle of the cycling season, no doubt. Still, being able to explore new media and interact with fans is branding at its best. It is all about hearts and minds, I guess. Tony Martin putting an end to Fabians dominance in the TTs with his win at the Worlds. Another achievement worth mentioning, as was Froome in the Vuelta. Getting Cavendish, Jens Voigt and Cancellara on twitter has made me many laughs this year. There were of course other incindents we won't miss. The crashes at the tour bringing down the number of GC contenders was terrible to watch. Yes, a natural part of pro cycling, but still. The ongoing Contador case is very embarrasing for cycling, for the UCI, for the Spanish cycling federation and not least for the riders left to compete with riders under investigation.